The greatest destroyer of peace is abortion, because if a mother can kill her own child what is left for me to kill you and you to kill me? There is nothing between. Love is repaid by love alone! A joyful heart is like the sunshine of God's love, the hope of eternal happiness. People are unreasonable, illogical, and self-centered. Love them anyway. If you do good, people may accuse you of selfish motives. Do good anyway. If you are successful, you may win false friends and true enemies. Succeed anyway. The good you do today may be forgotten tomorrow. Do good anyway. Honesty and transparency make you vulnerable. Be honest and transparent anyway. What you spend years building may be destroyed overnight. Build anyway. People who really want help may attack you if you help them. Help them anyway. Give the world the best you have and you may get hurt. Give the world your best anyway. I believe in person to person. Every person is Christ for me, and since there is only one Jesus, that person is the one person in the world at that moment. There is more hunger in the world for love and appreciation than for bread. We need to find God, and he cannot be found in noise and restlessness. God is the friend of silence. See how nature -- trees, flowers, grass -- grows in silence; see the stars, the moon and the sun, how they move in silence. We need silence to be able to touch souls. 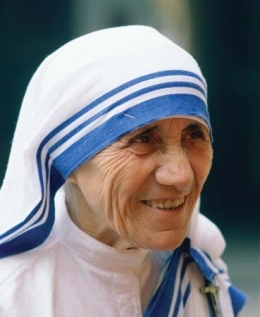 33 quotes by Mother Teresa.